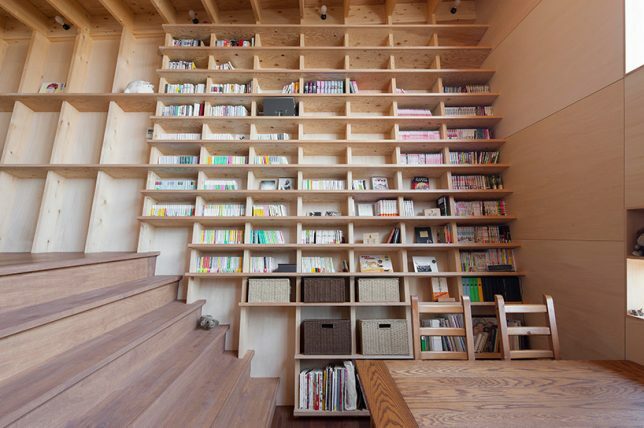 No ladders are required to get all the way to the top of this floor-to-ceiling bookshelf in a Japanese home, built into a specially designed oblique exterior wall for both easy access and earthquake resistance. 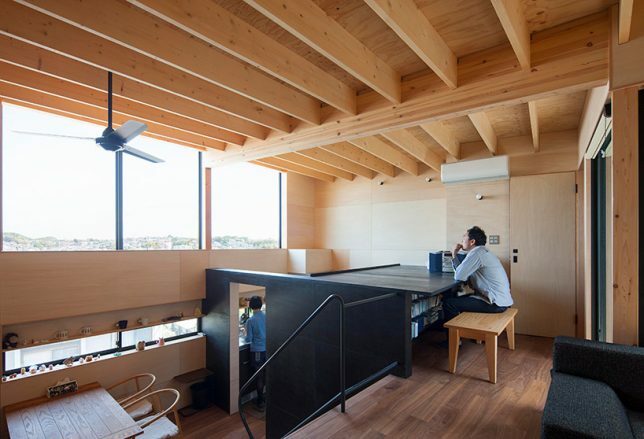 Shinsuke Fujii Architects rose to the challenge of a tight lot with a smart design that uses a high ceiling, split levels and climbable surfaces to make the best possible use of every square inch of space. First of all, that wall. From the outside of the home, you can see that the neighboring home on the right is awfully close, and taking up the maximum amount of living space on the lot would have been a tight fit. 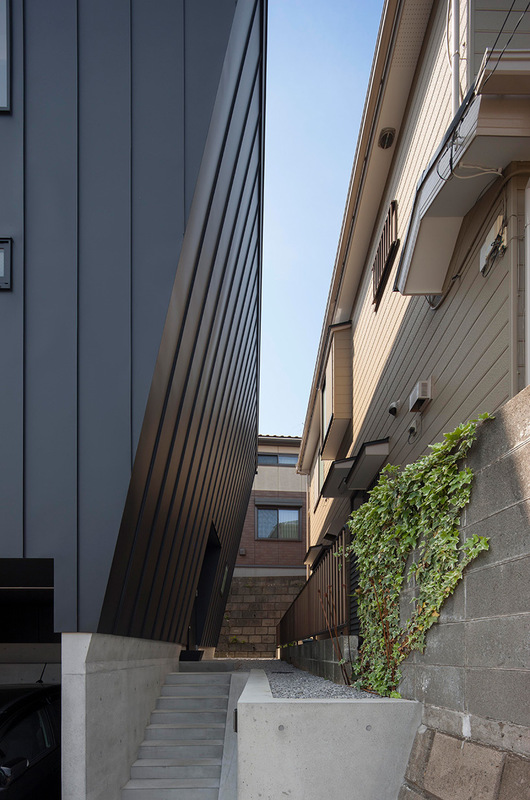 The architects leaned this wall of the home toward the neighbor at the top, leaving a wide space at the base for the front entrance, which is protected from rain. There are no windows on this side, eliminating privacy concerns that would normally arise from being right across from each other. 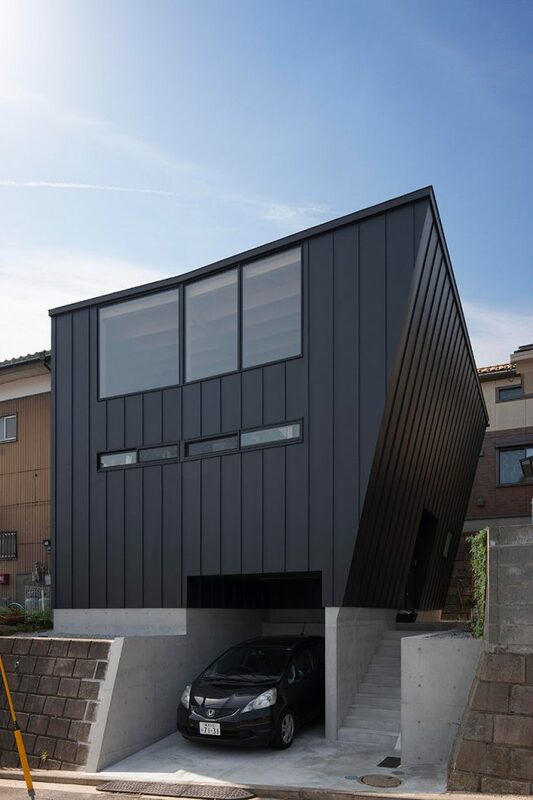 The home is also perched over a small carport that’s sized just right for the client’s compact car. Inside, this angle creates the perfect surface for a super-tall bookshelf that’s easy to climb, making it possible to use the entire wall for storage. Plus, the grid of the bookshelf makes the wall more structurally stable, and the bookshelf won’t collapse onto the interior in the event of a quake. Books, magazines and storage boxes easily slot into the deep niches while the extra-wide shelves double as steps. Stairs lead from the bookshelf up to a lofted living area, which gazes out onto views of the city rather than the neighboring houses. An outdoor terrace doubles as a giant skylight, and the ceiling of the kitchen below becomes a surface for a table, with additional storage set into the wall. 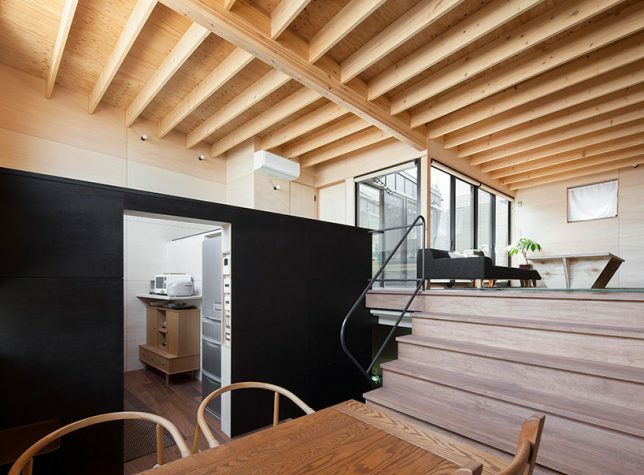 It’s a great example of thinking outside the box to create a home that feels spacious, airy, private and well-lit without sacrificing storage space, even on a tiny urban parcel.